Our oldest daughter is about to turn 12 years old. She is such a blessing to our family and everyday I thank the Lord that He choose me to be her mommy. Turning 12 means she’s not far from those ‘dreaded’ teenage years. I say dreaded because from the world all we really hear about teenagers is all the negative stuff. The attitude problems, the feeling of superiority, the laziness, the grumpiness, the selfishness. I could go on and on. If you are a parent, you’ve heard the familiar questions and/or statements…. I wonder if parents contribute or unknowingly encourage selfishness from teenagers? It seems we’ve accepted that the teenage years are tough so we must excuse their behavior and give in to them since they are having such a hard time dealing with their every changing emotions. It’s like they stop being a parent until their children are past the teenage years and they hope for the best. How about we keep the communication lines open. We acknowledge the changes they are experiencing, we embrace the changes and our children. As parents, we’ve been through these changes and we know and understand what they are feeling. I want to help my children navigate these changes and look at them as an exciting time in their lives that the Lord is using to transform them into adults. We have been blessed to see teenagers that are part of families who have effectively gone through (or are still in the midst) the teenage years. They have raised these young adults to process the changes to their bodies and emotions with the Lord’s will in mind. They do not spend hours alone in their room playing video games or watching terrible TV. They spend a lot of time together with their family and they enjoy it! Gasp! A teenager enjoying spending time with their family?? Yes, it is possible. They’ve been taught God’s design for family and how we were made for relationship. They were taught to build up their siblings and to invest in each others lives. No, they are not perfect but their parents don’t expect them to be. As an adult I still struggle with attitude problems but I look to scripture to adjust my attitude and emotions. We know many that have never had their own room… and they have survived! Why the push for their own room? From someone who had their own room growing up (for most of the time) I say it is highly overrated. Anyway, for our almost 12 year old she knows that it’s ok to want to spend time alone and when she wants that time we’ve taught her sisters and brother to respect her desire for alone time. It might be slightly more challenging to find some ‘space’ when you share a room but it isn’t impossible; we just get creative. As a parent, I don’t want to succumb to the teenager years; I want to embrace them! We are around families that have enjoyed the teenage years. Yes, there were struggles but it doesn’t have to be as bad as the world expects. Phil and I pray daily for our children. Not that they will be perfect little robots but that the Lord will graciously shape them into the beautiful adults He longs for them to be. We pray that He gives us wisdom and grace on navigating these exciting years. What a blessing it is to be a parent. Russia is one of Phil’s many passions and homeschooling is mine. I have seen the fruit of homeschooling through many friends and families and in my own family. I believe it gives the parents opportunity to build Godly character into their children and develop a deeper relationship that is much harder to foster when your children are away from home 6-8 hours a day, 5 days a week for 9 months of the year. As for academics, I believe I can teach my children just as well, if not better, then a public school teacher. I can give my children many hours of one-on-one time and curriculum tailored to their learning style. I could write several posts on why I’m passionate about homeschooling but for now let’s stick to the mission trip! We will be helping to run a 2 day homeschooling and family discipleship conference and following up with families as needed or requested. Below is the support letter we recently sent out. We have raised just over a 1/3 of what we need in order to serve the families in Russia. Due to time constraints and logistics it looks like just Phil, Natasha and Mikayla will be going this spring. We pray that all of our family would be able to go next spring to help with this conference. Would you consider giving to our mission trip? Hello from the Wilson family in Lakewood, Colorado! My family and I have some very exciting news to share and an important question to ask you. Many of you know that Gaylene and I have a passion for homeschooling, family discipleship, and ministering to both believers and non-believers in Russia. Ever since I returned from the Siberian mission field in 1998, God has continued to shape this vision of encouraging the Russian people, specifically through family discipleship and home education. For the past six years, Gaylene and I have been homeschooling our children. Many of my family’s greatest blessings are directly related to major changes in our lives that came about through homeschooling. We now have a strong desire for Russian Christian families to enjoy these same blessings, which brings me to share our exciting news. In May 2015, Gaylene and I, along with our two oldest children, have the opportunity to partner with Paideia Missions to serve, encourage, and teach at a home education and family discipleship conference in Saint Petersburg, Russia. Our plan is to travel to Russia a week before the start of the three-day conference to help with final preparations and then stay a week after the conference to encourage the many new homeschooling families in the Saint Petersburg area. The goal of this conference and Paideia Missions is to fulfill the Great Commission by promoting Christian home education and family discipleship. To learn more about Paideia Missions, please view Scott and Andie Davidson’s very informative video at http://youtu.be/KjTyvnCsCQo (copy and past the link into your browser) and visit the organization’s website at http://paideiamissions.com. Now, as to our important question, we are humbly seeking support to fund this short-term mission trip. As the Lord leads you, would you consider making a contribution to Paideia Missions on behalf of the Wilson family? Our family’s trip budget has not been finalized yet, but our initial estimate is $6,000. Additionally, we ask for your prayers for wisdom, serving hearts, and good health while on the trip. Thank you for prayerfully considering our need. As always, we hold you near in our thoughts and prayers. May the Lord’s blessing be upon you. 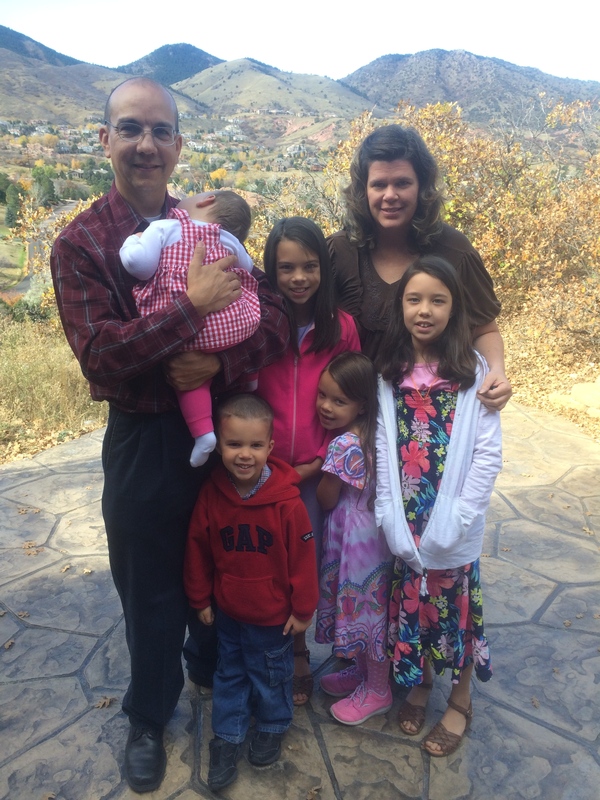 All gifts to Paideia Missions on behalf of the Wilson family are tax deductible. If you are able to support this mission work, donations can be made online at http://paideiamissions.com. If you have any questions, please contact Phil at 720-252-3761 or philipcwilson@reagan.com. If you prefer, you may also donate airline miles. Great Food, Contagious Laughing, Encouragement… oh and Cake! Last night we had the pleasure of having a young courting couple over for dinner. What a wonderful evening! Natasha and Mikayla’s piano teacher, Miss Rebecca, is engaged to a wonderful young man named Jonathan (great name huh?!) Jonathan lives in San Diego so this has been a long distance courtship. Jonathan’s family has known Rebecca’s family for 10+ years going back to when Rebecca and her family lived in California. It has been such a blessing watching this relationship form and grow. I am so grateful that our children, specifically our oldest girls, have been able to watch all of it transpire. Our girls are able to see what God desires for relationship and marriage versus what the world dictates. Over the last 6 months, Rebecca and Jonathan have developed a relationship built on God’s word and not their own desires. They started this relationship with the end in mind. Meaning, their goal from the beginning was to decide if they could create a Godly lifelong marriage. They pray that their marriage will bring glory and honor to God, not just fulfill their own desires. How refreshing! We had a wonderful evening getting to know Jonathan. He is the oldest of 6 children and his father died when he was 19. In essence he became the dad for quite a while helping his mom raise the rest of the kids and he wanted to be sure they all had a foundation in Christ. He is a man that seeks to honor the Lord and be the spiritual leader in his family. We ate lots of pizza and salad. And, since I’m doing the wedding cake, I made a vanilla cake and a chocolate cake so they could taste test and decide which they wanted for their special day. Also, four of our kids are set to be in the wedding… amazing! We’ll see if our Jonathan will actually walk down the isle as the ring bearer! We are looking forward to May 16th and the celebration of a new marriage!